A portrait of the true legend Dame Vera Lynn painted by the acclaimed Norwegian artist Ross Kolby and commissioned by The London Mint Office will be gifted on completion this year to the Royal Albert Hall, which Dame Vera regards as “the perfect place” for her portrait. Dame Vera Lynn will be 102 in March, and is an iconic artist synonymous with World War 2, recognised as the Briton who best exemplified the spirit of the 20th century. She performed at the Royal Albert Hall on fifty-two occasions, was most recently seen there in a video recording on 6 June 2014 at the BBC Radio 2 ‘D-Day 70 Years On’ concert, and is delighted to see this final portrait of her, the first in decades, to hang there on public display for posterity. It is currently being painted by the Norwegian artist Ross Kolby, famous for his portraits ‘The Kings of the Liberation’, a triple portrait to celebrate the 70th anniversary of the liberation of Norway from German occupation. The paintings feature the three generations of Norwegian monarchs attached to the events of World War 2, and now hang in Norway’s Resistance Museum in Oslo. He captures Dame Vera in a painting full of symbols pointing at her life and events in World War 2. The London Mint Office is at the centre of British numismatics, bringing the fascinating world of coin collecting to both existing and new collectors, and is working with Dame Vera on a collection to mark this year’s 75th anniversary of D-Day. 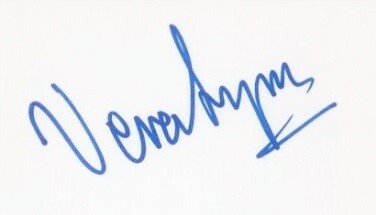 Dame Vera said: “It was a pleasure to meet Ross earlier this year and I am delighted that he is painting my portrait. I have seen the draft sketch and it is wonderful how he has managed to include so many of the key elements of my life into the painting. Vera Lynn was a popular recording artist of 22 when war broke out in 1939, and ‘the Forces’ Sweetheart’ went on to become a symbol of the wartime era and an inspiration to the Allied troops worldwide. 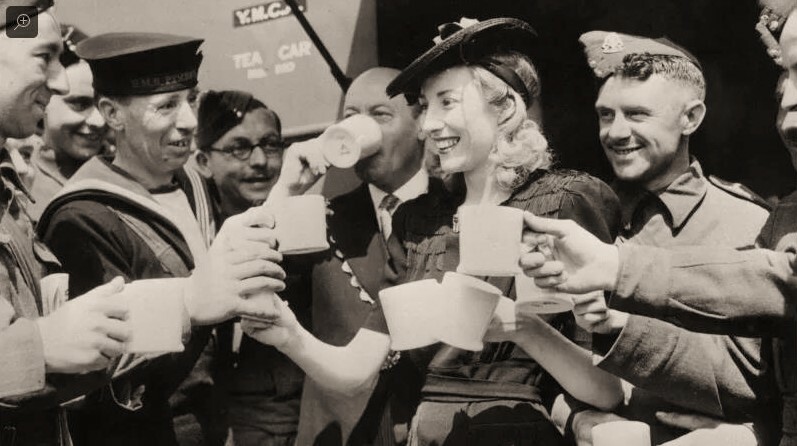 Vera Lynn cheering with military personnel after a concert. Her BBC radio programme ‘Sincerely Yours’ featured messages and songs to the British troops worldwide, each one ending with the legendary ‘We’ll Meet Again’ which inspired and comforted troops and civilians alike. Another of her timeless songs, ‘The White Cliffs of Dover’ brought hope of freedom in the darkest hours. Her enduring popularity produced a No. 1 album in 2009 for ‘We'll Meet Again: The Very Best of Vera Lynn’, and she became the oldest recording artist in the world when she reached No. 3 on the charts with ‘Vera Lynn 100’ in 2017. The London Mint Office is part of the Samlerhuset Group which produces the medal for the annual Nobel Peace Prize, and worked with Kolby on ‘The Kings of the Liberation’. Kolby said: “It is a true honour to be able to portray Dame Vera, who by her personality and her dedication became the heart of a nation. Through her music, BBC broadcastings and travels she spread hope, inspiration and joy to both the Allied forces as well as to the public all over the world during WW2. “Dame Vera is a symbol of the uniting of countries and peoples that brought down the dark forces in the world during WW2. This uniting is no less important today, and she remains a true inspiration of how much one single person can mean and do in difficult times. “I am delighted to work with The London Mint Office on this project, and it is a true honour that the painting will find its place in the Royal Albert Hall." Kolby met with Dame Vera at her home in Ditchling and made sketches that he is working from for the painted portrait. It will be made in oil on wood, and will, appropriately, have a handmade, high quality wooden frame. The size of the portrait will be approximately 90 cm x 70 cm. Norwegian artist Ross Kolby (48) is known for paintings on a wide range of topics. His futuristic vision of an African Pope became an image that gave rise to worldwide debate. Kolby has for several years worked extensively with portraits of individuals central to the events of WWII. His triple portraits ’The Kings of the Liberation' are of King Haakon VII, who fled to London on the Nazi invasion, and led his exile Government and Norway's freedom fight from there; of King Olav V, who as the Crown Prince worked by his father's side in this fight; and of Prince Harald - His Majesty King Harald V today - who as the future heir to the throne in Norway became the centre of a campaign in 1940 to be accepted by Hitler as Norway's child king. Prince Harald managed to flee to Washington with his mother and sisters as guests of President Roosevelt, where they remained throughout the war. The London Mint Office is a trusted and respected partner for a large number of British coin collectors and mints across the world. Gold, silver and other precious metals have fascinated mankind for many centuries, making coin collecting a popular hobby the world over. The London Mint Office is at the centre of British numismatics, bringing the fascinating world of coin collecting to both existing and new collectors. Together with their sister organisations across Europe, The London Mint Office provides a wide range of coins from ancient to modern, originating from virtually every country in the world. Visit www.londonmintoffice.org for more information.